Working with corporate clients can be a daunting process for many artists, but it can also open up opportunities to develop new works of art that are often influenced by the uniqueness of a place or space. When your artwork is incorporated into a curated art program, you not only get more exposure as an artist, but also the chance to see how your artwork can add value to a larger narrative. 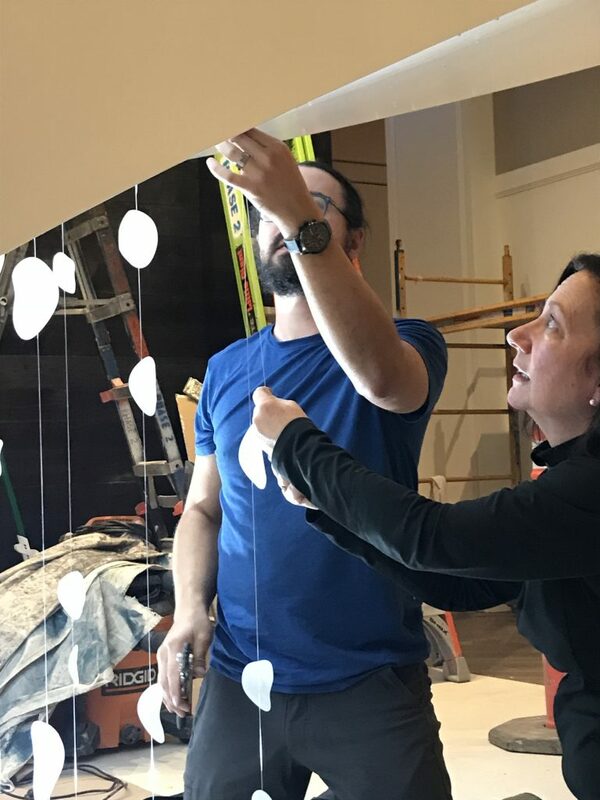 When we finished curating the art collection for The Elizabeth Hotel in Fort Collins, Colorado, we reflected on the process it took to make it all happen. Working primarily with Colorado-based artists – many of whom had ties to nearby Colorado State University – we created an eclectic collection around central themes of nature and music, celebrating Fort Collins as a creative frontier. While NINE dot ARTS may have pulled it all together, it was the artists who truly brought the vision for the space to life. Take Denver-based artist Jane Guthridge for example. Inspired by Colorado’s abundant sunlight and the ethereal qualities of nature, her commissioned artwork, Suspended Light, creates an unexpected moment underneath the staircase, an often-overlooked space in any room. And while the final product is quite mystifying, her creative process was equally magical to watch. After precisely measuring the space, Jane cut monofilament into varying lengths and attached oval shapes of duralar at calculated intervals on each line. 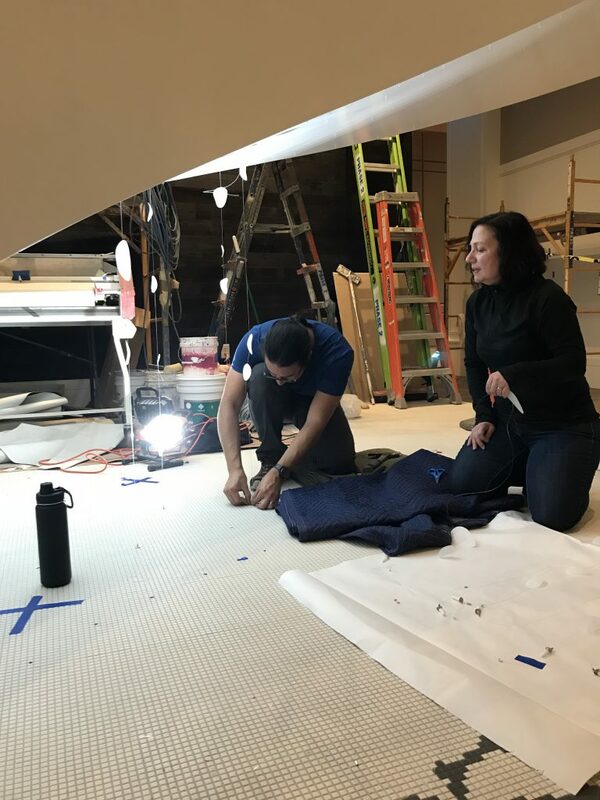 The piece was then installed by anchoring the lines to the floor as well as underneath the staircase by crimping the monofilament around hooks in the ceiling. The oval shapes of the duralar appear to float suspended like beads of light. The monofilament, when seen up close, almost looks like the strings of a harp. Both reflect natural and artificial light from various sources, changing the appearance of the piece throughout the day. Jane’s final result makes an unforgettable statement when guests walk through the lobby. Another artist that took her artistry and imagination to the next level for The Elizabeth was Liese Chavez. Based in Manitou Springs, Liese is known for her Victorian-aesthetic, surrealist paintings. 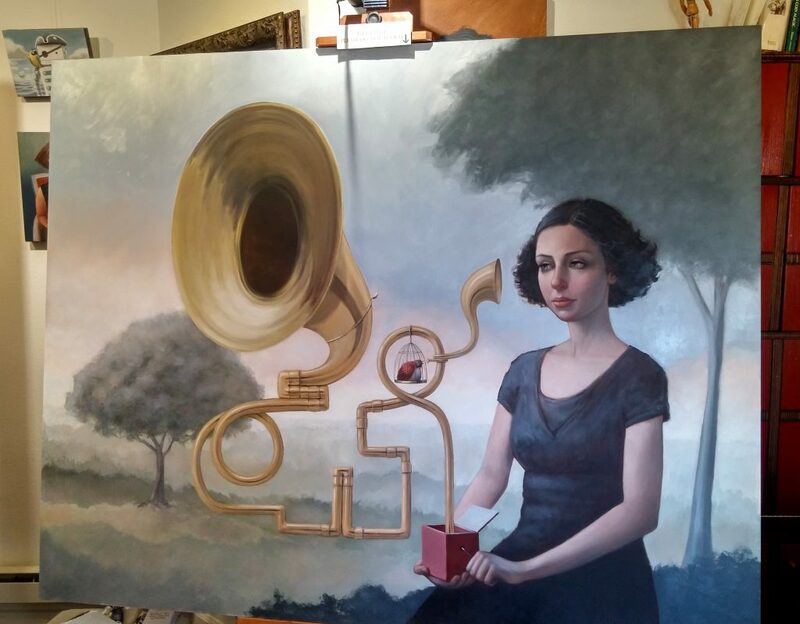 Her artwork titled The Music Box is also her largest painting to date, thanks to a little encouragement from our NINE dot ARTS team. Created with a palpable dry sense of humor, the distant stare and rigid posture of the woman are counterbalanced by the fantastical loops and turns of the horn. The Elizabeth’s collection is filled with artworks from artists who are making their mark not only in Colorado, but also nationally (and even internationally). We’re grateful to be part of their stories, and love working with artists to expand their reach and push their artistry to new heights.